I'm usually not a fan of remakes, most often because the remakes rarely set out to re-imagine or enhance the original film. Instead, it's usually a case of special effects obsession where a studio wants to show off some new technology, but the movie is no better (or actually worse) than the original they seek to overshadow. On some occasions, though, remakes fall into the right hands and you get something entertaining and admirable on its own merits. Such a case is the Chuck Russell-Frank Darabont revisitation of The Blob. While the 1958 original (reviewed here) is considered a classic, I've never particularly liked the film, personally. While the concept was interesting, it was little more than your average b-movie with a more advanced budget. To me, The Blob needed a newer, fresher approach. Taking some direct cues from the original, the story follows the plight of of Arborville, your average small town. One evening, a mysterious meteor comes crashing down in the nearby forest. An old hermit investigates the crash site only to find a weird, jelly-like substance coming out of the meteor. The jelly attaches itself to the man's hand and begins eating away at him. Meanwhile, local football star Paul Taylor (Donovan Leitch) is out on a date with Meg Penny (Shawnee Smith). While driving into the woods, they stumble across the old man and take him to the hospital. Of course, once there, the old man is promptly engulfed by the deadly gel and the resulting, enlarged "blob" goes on to wreak havoc on the town, killing off anyone it comes across. Though the deaths are initially blamed on local delinquent Brian Flagg (Kevin Dillon), Meg discovers he's probably the only one with any rational sense of what's going on, and they team up to save the town. To me, one of the clever aspects to this 1988 vision of The Blob is how it sets itself up similar to the original, but then quickly abandons all of the initial characters in favor of making the "unpopular kid" (Brian Flagg) and the seemingly meek cheerleader (Meg Penny) the main heroes. None of Arborville's 'respectable' citizens turn out to be very reliable or endure very long. Still, the script manages to include the more memorable moments from the original, including a great re-creation of the famous movie theater sequence. None of this would be terribly effective, though, if not for the great special effects. The blob is much more of a convincing, deadly creature in this version, and with this new spin comes creative new deaths. Ramping up the gore factor, Chuck Russell and crew have created, in my mind, some of the more memorable death scenes in any sci-fi/horror film I can think of from the time, including a great sequence where a man is sucked down a kitchen sink by the purple menace. New story elements are introduced, the biggest of which is a government conspiracy angle that adds some well needed human element to the film, putting a face behind the terror of the blob. If there's one thing I hated in the 1958 version was the plodding pace and boring waits for something exciting to happen. Here, this isn't an issue as the pace is very well set and the effects/action sequences are properly dispersed and appropriately intense. Most importantly, it's all very entertaining without coming across as laughable. That's pretty impressive considering the film is about a giant mass of grape jelly killing off innocent people. Image Transfer Review: Overall, I was a bit let down by the transfer, which shows excessive grain and haze, not to mention print damage. The resulting image is very soft and sometimes heavily artifacted. There are long periods where the film looks just fine, but in general, this could stand improvement. I also noticed a strange tendency for the film to 'jerk' as if there were dropped frames, but yet the audio remained in perfect synchronization; possibly the evidence of 2-3 pulldown (which I've noticed on sporadic occasions with other Columbia discs). Audio Transfer Review: The Dolby 2.0 Surround audio provides a fairly good amount of front soundstage action and stereo effects. Unfortunately, it seems a bit harsh and tinny at times, especially in terms of dialogue, as if the Logic center channel was of significantly reduced quality to the rest of the material. Although a Pro-Logic surround channel is present, I don't recall any major usage of it, other than some very minor ambient sounds on scattered occasions. All of the language tracks sound the same, with no real improvements or problems beyond the English version. Extras Review: There are a number of subtitle language tracks, the original trailer, and two other trailers for Columbia TriStar DVDs. Unfortunately, no other extras are included. There's some cute menu animations, though, and the keepcase insert contains external chapter listings. The cover also uses the original VHS artwork. 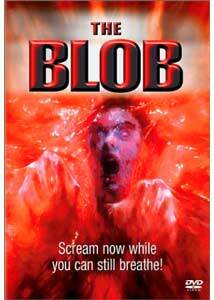 The Blob is a solid and fun update of the original, and certainly fits well in any sci-fi/horror collection. It joins the ranks of impressive remakes like The Thing. The lack of supplements or a stellar transfer makes this fan-only purchase territory, though.